Using the latest Census Bureau data from 2010 and 2011, this paper provides a detailed picture of the more than 50 million immigrants (legal and illegal) and their U.S.-born children (under 18) in the United States by country of birth, state, and legal status. One of the most important findings is that immigration has dramatically increased the size of the nation’s low-income population; however, there is great variation among immigrants by sending country and region. Moreover, many immigrants make significant progress the longer they live in the country. But even with this progress, immigrants who have been in the United States for 20 years are much more likely to live in poverty, lack health insurance, and access the welfare system than are native-born Americans. The large share of immigrants arriving as adults with relatively little education partly explains this phenomenon. The number of immigrants (legal and illegal) in the country hit a new record of 40 million in 2010, a 28 percent increase over the total in 2000. Of top sending countries, the largest percentage increase in the last decade was for those from Honduras (85 percent), India (74 percent), Guatemala (73 percent), Peru (54 percent), El Salvador (49 percent), Ecuador (48 percent), and China (43 percent). In March of 2011, the share of working-age (18 to 65) immigrants holding a job was the same as natives — 68 percent. Immigrant men have higher rates of work than native-born men, while immigrant women have lower rates. While immigrants tend to be concentrated in certain jobs, natives comprise the majority of workers in virtually every occupational category. For example, natives comprise 52 percent of maids, 73 percent of janitors, 66 percent of construction laborers, and 65 percent of butchers and meat processors. Among the top sending countries, poverty is highest for immigrants and their young children from Mexico (35 percent), Honduras (34 percent), and Guatemala (31 percent); and lowest for those from Germany (7 percent), India (6 percent), and the Philippines (6 percent). Among the top sending countries, the highest rates of uninsurance are for those from Guatemala (46 percent), Honduras (44 percent), El Salvador (44 percent), and Mexico (41 percent); and lowest for those from Canada (9 percent), Japan (8 percent), and Germany (5 percent). There are 10.4 million students from immigrant households in public schools, accounting for one in five public school students. Of these students, 78 percent speak a language other than English at home. Rates of home ownership are highest for immigrants from Italy (83 percent), Germany (75 percent), and the United Kingdom (73 percent); and lowest for those from Guatemala (30 percent), Honduras (28 percent), and the Dominican Republic (24 percent). In 2010, 13 percent of immigrant households were overcrowded, compared to 2 percent of native households. Immigrant households account for half of all overcrowded households. Among the top sending countries, self-employment is highest for immigrants from Korea (26 percent), Canada (24 percent), and the United Kingdom (17 percent). It is lowest for those from Haiti (6 percent), Honduras (5 percent), and Jamaica (3 percent). The large share of immigrants with relatively little education is one of the primary reasons for their lower socioeconomic status, not their legal status or an unwillingness to work. At the same time immigration added significantly to the number of less-educated workers, the share of young, less-educated natives holding a job declined significantly. The decline began well before the current economic downturn. Many immigrants make significant progress the longer they live in the country. However, on average even immigrants who have lived in the United States for 20 years have not come close to closing the gap with natives. We estimate that 28 percent of all immigrants are in the country illegally. Roughly half of Mexican and Central American and one-third of South American immigrants are here illegally. New immigration (legal and illegal) plus births to immigrants added 22.5 million residents to the country over the last decade, equal to 80 percent of total U.S. population growth. Recent immigration has had only a tiny impact on the nation’s age structure. If the nearly 14 million immigrants who arrived in 2000 or later are excluded, it raises the average age in the United States in 2010 from 37.4 years to 37.6 years — roughly two months. Among top immigrant-receiving states, poverty among immigrants and their children is highest in Arizona (37 percent), North Carolina (29 percent), and Minnesota (29 percent). It is lowest in Massachusetts (17 percent) Maryland (13 percent), and New Jersey (13 percent). Among top immigrant-receiving states, the share of adult immigrants who have not completed high school is highest in Texas (46 percent), Colorado (41 percent), and North Carolina (36 percent). It is lowest in Virginia (15 percent), Massachusetts (15 percent), and Florida (16 percent). There are many reasons to examine the nation’s immigrant population. First, immigrants and their minor children now represent one-sixth of the U.S. population. Moreover, understanding how immigrants are doing is the best way to evaluate the effects of immigration policy. Absent a change in policy, between 12 and 15 million new immigrants (legal and illegal) will likely settle in the United States in the next decade. And perhaps 30 million new immigrants will arrive in the next 20 years. Immigration policy determines the number allowed in, the selection criteria used, and the level of resources devoted to controlling illegal immigration. The future, of course, is not set and when formulating immigration policy, it is critically important to know the impact of recent immigration. It is difficult to understate the impact of immigration on the socio-demographics of the United States. New immigration plus births to immigrants added more than 22 million people to the U.S. population in the last decade, equal to 80 percent of total population growth. Immigrants and their young children (under 18) now account for more than one in five public school students, one-fourth of those in poverty, and nearly one-third of those without health insurance, creating very real challenges for the nation’s schools, health care systems, and physical infrastructure. The large share of immigrants who arrive as adults with relatively few years of schooling is the primary reason so many live in poverty, use welfare programs, or lack health insurance, not their legal status or an unwillingness to work. Despite the fact that a large share of immigrants have few years of schooling, most immigrants do work. In fact, the share of immigrant men holding a job is higher than native-born men. Moreover, immigrants make significant progress the longer they reside in the United States. This is also true for the least educated. While many immigrants do very well in the United States, on average immigrants who have been in the country for 20 years lag well behind natives in most measure of economic well-being. At the same time that immigration policy has significantly increased the number of less-educated immigrants, there has been a dramatic deterioration in the labor market position of less-educated natives. Comparing data from the beginning of this decade shows a huge decline in the share of young and less-educated natives holding a job — from two-thirds to just under half. The decline in work among the young and less-educated natives began well before the Great Recession. It is difficult to find any evidence of a shortage of less-educated workers in the United States. Some may argue that immigrants only do jobs that American do not want, but an analysis by occupations shows that the vast majority of workers in almost every job are U.S.-born. A central question for immigration policy is: Should we continue to allow in so many people with little education — increasing potential job competition for the poorest American workers and the population in need of government assistance? The primary goal of this paper is to better inform that debate. The data for this paper come primarily from the public-use files of the 2010 American Community Survey (ACS) and the March 2011 Current Population Survey (CPS). In some cases, for state-specific information, we combine the March 2010 and 2011 CPS to get statistically robust results. In this report, the terms foreign-born and immigrant are used synonymously. Immigrants are persons living in the United States who were not American citizens at birth. This includes naturalized American citizens, legal permanent residents (green card holders), illegal immigrants, and people on long-term temporary visas such as foreign students or guest workers. There are many reasons to examine the nation’s immigrant population. First, the more than 50 million immigrants and their minor children now comprise one-sixth of U.S. residents, so how they are faring is vitally important to the United States. Moreover, understanding how immigrants are doing is the best way to evaluate the effects of immigration policy. Absent a change in policy, between 12 and 15 million new immigrants (legal and illegal) will likely settle in the United States in the next decade. And perhaps 30 million new immigrants will arrive in the next 20 years. Immigration policy determines the number allowed in, the selection criteria used, and the level of resources devoted to controlling illegal immigration. The future, of course, is not set and when deciding on what immigration policy should be, it is critically important to know what impact the immigration flow has had in recent decades. There is no one answer to the question of whether the country has been well served by its immigration policy. To evaluate the effect of this immigration it is necessary to draw on the available data. This paper uses the latest Census Bureau data to provide readers with information so they can make sound judgments about the effects of immigration on American society and on what immigration policy should be in the future. Although not explicitly acknowledged, the two most important ways of examining the immigration issue are what might be called the “immigrant-centric” approach and the “national” approach. They are not mutually exclusive, but they are distinct. The immigrant-centric approach focuses on how immigrants are faring, what is sometimes called “immigrant adaptation”. The key assumption underlying this perspective is not so much how immigrants are doing relative to natives, but rather how they are doing given their level of education, language skills, and other aspects of their human capital endowment. This approach also tends to emphasize the progress immigrants make over time on their own terms and the benefit of migration to the immigrants themselves. The immigrant-centric view is the way most, but not all, academic researchers approach the issue. The other way of thinking about immigration can be called the national perspective, which is focused on the impact immigration has on American society. This approach emphasizes that immigration is supposed to benefit the existing population of American citizens; the benefit immigrants receive by coming here is less important. So, for example, if immigration adds significantly to the population living in poverty or using welfare programs, this is seen as a problem, even if immigrants are clearly better off in this country than they would have been back home and are no worse than natives with the same education. This approach is also focused on possible job competition between immigrants and natives and the effect immigration has on public coffers. In general, the national perspective is the way the American public thinks about the immigration issue. When thinking about the information presented in this report, it is helpful to keep both perspectives in mind. There is no one best way to think about immigration. By approaching the issue from both points of view, the reader may arrive at a better understanding of the complex issues surrounding immigration. Data Sources. The data for this paper come primarily from the 2010 American Community Survey (ACS) and the March 2011 Current Population Survey (CPS). In some cases, for state-specific information we combined the March 2010 and 2011 CPS to get a larger, more statistically robust sample. The ACS and CPS have become the two most important sources of data on the size, growth, and socio-economic characteristics of the nation’s immigrant population. In this report, the terms foreign-born and immigrant are used synonymously. Immigrants are persons living in the United States who were not American citizens at birth. This includes naturalized American citizens, legal permanent residents (green card holders), illegal aliens, and people on long-term temporary visas such as foreign students or guest workers who respond to the ACS or CPS.1 We also use the terms illegal alien and illegal immigrant interchangeably. The 2010 ACS is of particular value because it the first ACS weighted to reflect the results of the 2010 decennial census. 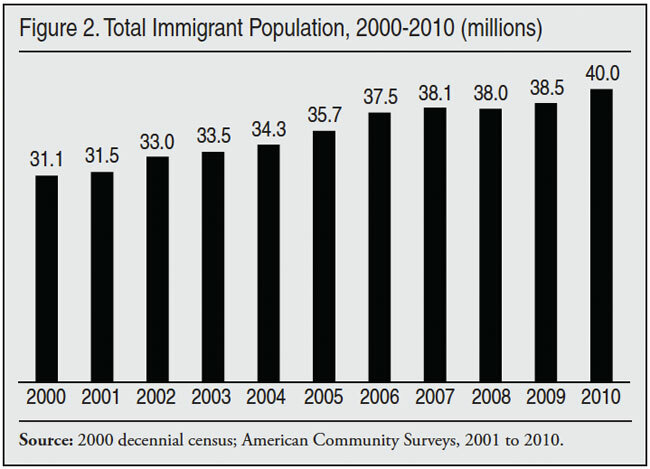 (The decennial census itself no longer includes any immigration-related questions.) The public-use sample of the 2010 ACS used in this study has roughly 3.1 million respondents, nearly 350,000 of whom are immigrants. It is by far the largest survey conducted by the U.S. Census Bureau. The ACS includes all persons in the United States, including those in institutions such as prisons and nursing homes. Because of its size and complete coverage we also use the ACS in this report to estimate the overall number of immigrants, their year of arrival, and other statistics at the national and state level. Because it includes questions on language and public school enrollment not found in the CPS, we use the ACS to examine these issues as well. While the ACS is an invaluable source of information on the foreign-born, however, it contains fewer questions than the CPS. The March CPS, which is also called the Annual Social and Economic Supplement, includes an extra-large sample of minorities. While much smaller than the ACS, the March CPS still includes about 210,000 individuals, more than 26,000 of whom are foreign-born. Because the CPS contains more questions it allows for more detailed analysis in some areas than does the ACS. The CPS has been in operation much longer than the ACS and for many years it has been the primary source of data on the labor market characteristics, income, health insurance coverage, and welfare use of the American population. The CPS is also one of the only government surveys to include questions on the birthplace of each respondent’s parent, allowing for generational analysis of immigrants and their descendants. Another advantage of the CPS, unlike the ACS, is that every household in the survey receives an interview (phone or in-person) from a Census Bureau employee. The survey questions are complex and having a live person ask the questions almost certainly improves data quality. In contrast, most respondents to the ACS mail in their questionnaire and never actually speak to a Census Bureau employee. Moreover, respondents remain in the CPS for several months at a time and this, too, means there is some relationship with the Bureau. Like the ACS, the CPS is weighted to reflect the actual composition of the total U.S. population. Unlike the ACS, the CPS does not include those in institutions and so does not cover the nation’s entire population. However, those in institutions are generally not part of the labor market nor are they typically included in statistics on health insurance coverage, poverty, income, and welfare use. Immigration has clearly played an important role in American history. 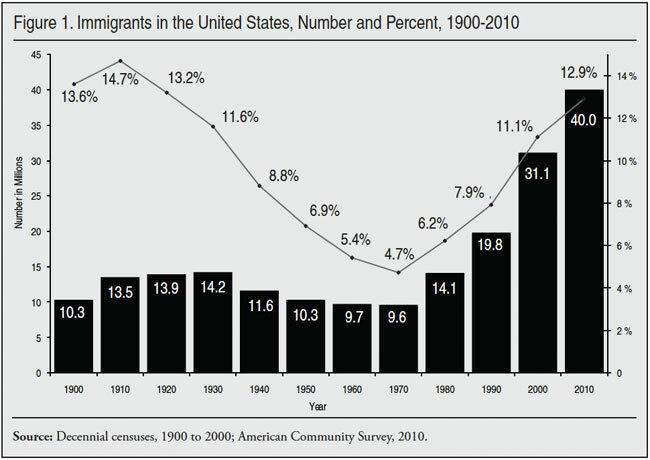 Figure 1 reports the number and percentage of immigrants living in the United States from 1900 to 2010. Figure 1 shows very significant growth in the foreign-born both in absolute numbers and as a share of the total population since 1970. The immigrant population in 2010 was double that of 1990, nearly triple that of 1980, and quadruple that of 1970, when it stood at 9.6 million. The increase in the size of the immigrant population has been so dramatic (20.2 million) in the last two decades that just this growth is double the size of the entire foreign-born population in 1970 or even 1900. The seemingly large growth of 1.5 million immigrants from 2009 to 2010 should be interpreted with caution because the 2010 data were weighted using the 2010 census. While the number of immigrants in the country is higher than at any time in American history, the immigrant share of the population (12.9 percent in 2010) was higher 90 years ago. In terms of the impact of immigrants on the United States, both the percentage of the population made up of immigrants and the number of immigrants are clearly important. The ability to assimilate and incorporate immigrants is partly dependent on the relative sizes of the native and immigrant populations. On the other hand, absolute numbers also clearly matter; a large number of immigrants can create the critical mass necessary to foster linguistic and cultural isolation regardless of their percentage of the overall population. Absent a change in policy, the number and immigrant share of the population will continue to increase for the foreseeable future. Figure 2 reports the size of the foreign-born population from 2000 to 2010 based on the ACS. The figure shows significant growth during the last decade. The figure for 2000 is from the decennial census because the ACS was not fully implemented in 2000. The ACS was not fully implemented until 2005 and did not include those in group quarters until 2006. Figure 2 shows a significant fall-off in the growth of the immigrant population from 2007 to 2009, with an increase of only 400,000 over that two-year period. Flow of New Immigrants. Another way to examine trends in immigration is to look at responses to the year-of-arrival question. In addition to asking respondents if they are immigrants, the ACS also asks them what year they came to the United States to live. Of the 40 million immigrants in the country in 2010, 13.9 million (±99,000) responded that they came to the United States in 2000 or later. This would translate into 1.3 to 1.4 million new arrivals annually during the last decade. Some prior research indicates that 5.2 percent of immigrants are missed in the ACS.4 So the actual level of new immigrants could be closer to 1.5 million a year during the decade just completed. Moreover, Figure 3 by itself indicates that immigration remained very high throughout the decade, though the number of new arrivals was higher in 2000 and 2001 than later in the decade. This is a reminder that immigration is a complex process; not simply a function of labor-market conditions. Factors such as the desire to be with relatives or to enjoy political freedoms and lower levels of official corruption play a significant role in immigrants’ decisions to come to the United States. The generosity of America’s public benefits and the quality of public services can also make this country an attractive place to settle. These things do not change during a recession, even a steep one. Deaths and Outmigration. By definition, no one born in the United States is foreign-born and so births cannot add to the immigrant population. Moreover, each year some immigrants die and others return home. There is some debate about the size of out-migration, but together deaths and return-migration equal 1 to 1.5 percent of the immigrant population annually, or 400,000 to 600,000 each year over the last decade. For the foreign-born population to grow, new immigration must exceed deaths and outmigration. It is possible to estimate deaths and outmigration during the decade just completed based on the ACS data. Given the age, gender, race, and ethnic composition of the foreign-born population, the death rate over the last decade should be about seven per 1,000. (These figures include only individuals living in the United States and captured by the ACS, not any deaths that occur among illegal immigrants trying to cross the border.) This means that the number of deaths over the last decade varied from about 217,000 a year at the start of the decade to nearly 266,000 by the end of the decade, for a total of about 2.4 million deaths during this time period. Assuming 2.423 million deaths during the decade among the foreign-born and 13.863 million new arrivals, and growth of 8.847 million, the implied level of emigration should be about 2.592 million during the decade. The equation looks as follows: outmigration = new arrivals – (growth + deaths). Filling in the numbers we get the following result: 2.592 million = 13.863 – (8.847 million + 2.423 million). This implies 2.592 million immigrants left the United States during the decade. Net immigration equals new immigration minus outmigration (13.863 – 2.592) or 11.271 million during the last decade. Of course, it must be emphasized that this estimate is for the entire decade and outmigration may have varied significantly from year to year. Further, these estimates do not include the arrival and departure of individuals who came and went during the decade, such as a person who arrived in 2001 and left in 2008. There is also no adjustment for undercount in these numbers. So the estimate of slightly less than 2.6 million departures for the decade is a low-range estimate. Deaths, on the other hand, do not vary very much and should grow slowly but steadily as the size of the foreign-born population grows. State Data. Table 1 shows the number of immigrants in each state for 2010. California, New York, Texas, Florida, New Jersey, Illinois, Massachusetts, Georgia, Virginia, Washington, Arizona, and Maryland have the largest immigrant populations. Each of these states had more than 800,000 foreign-born residents in 2010. California has the largest immigrant population, accounting for more than one-fourth of the national total. New York and Texas are next with about 10 percent of the nation’s immigrants. With 9 percent of the nation’s immigrants, Florida’s foreign-born population is similar in size. New Jersey and Illinois are next with 5 and 4 percent of the nation’s immigrants respectively. 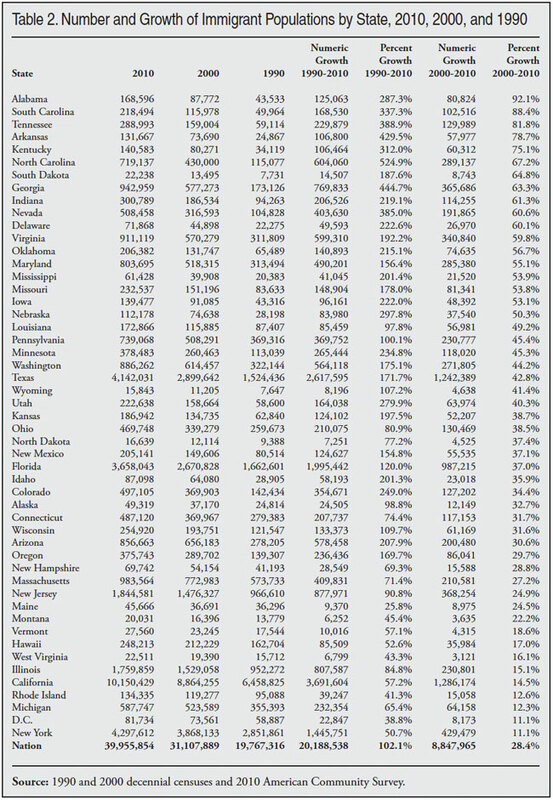 Table 1 shows that the immigrant population is concentrated in relatively few states. Six states account for 65 percent of the nation’s foreign-born population, but only 40 percent of the nation’s overall population. Table 1 also shows the year of arrival for the foreign-born population in each state. As already noted, in 2010 13.9 million had arrived in 2000 or later. This means that 26.1 million (65 percent) immigrants have lived in the United States for more than 10 years. The ACS also shows that, on average, immigrants have lived in the United States for slightly more than 19 years.9 Thus the immigrant population in the United States is comprised mostly of long-time residents. As will become clear in this report, immigrants have much higher rates of poverty, uninsurance, and welfare use and lower incomes and home ownership rates. However, the economic status of the immigrant population is not because they are mostly new arrivals. Many of the states with the largest immigrant populations are also those with the highest foreign-born shares. However, several smaller states, such as Hawaii and Nevada, rank high in terms of the percentage of their populations that are foreign-born, even though the overall number of immigrants is more modest relative to larger states. 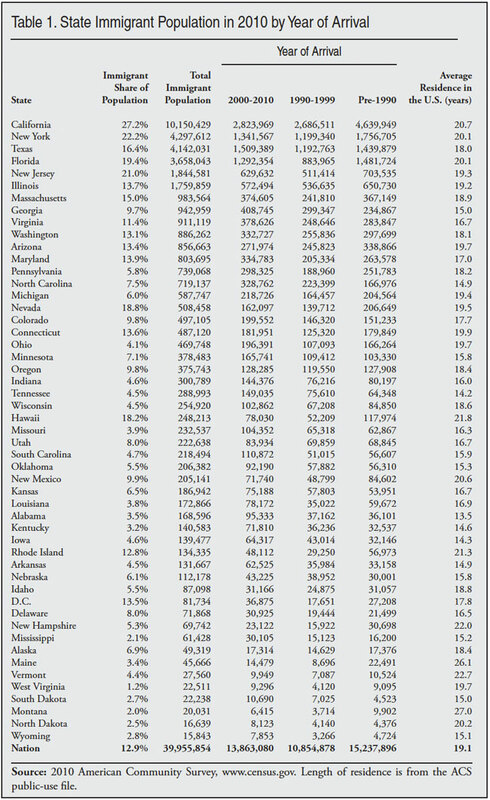 Table A1 in the appendix shows the share of each state’s populations comprised of immigrants in in 1990, 2000, and 2010. Table A2 shows citizenship rates by state. Table 2 reports the size of state immigrant populations in 2010, 2000, and 1990. While the immigrant population remains concentrated, it has become less so over time. In 1990, California accounted for 33 percent of the foreign-born, but by 2000 it was 28 percent, and by 2010 it was 25 percent of the total. If we look at the top six states of immigrant settlement, they accounted for 73 percent of the total foreign-born in 1990, 68 percent in 2000, and 65 percent in 2010. Table 2 also shows there were 13 states where the growth in the immigrant population was more than twice the national average of 28 percent over the last decade. These states were Alabama (92 percent), South Carolina (88 percent), Tennessee (82 percent), Arkansas (79 percent), Kentucky (75 percent), North Carolina (67 percent), South Dakota (65 percent), Georgia (63 percent), Indiana (61 percent), Nevada (61 percent), Delaware (60 percent), Virginia (60 percent), and Oklahoma (57 percent). It is worth noting that the growth rate in California, the state with the largest immigrant population growth, was only about half the national average over the last decade. Table 2 makes clear that the nation’s immigrant population has grown dramatically outside of traditional areas of immigrant settlement like the Golden State. Tables 3, 4, and 5 report immigrant figures by region and country of birth.10 Table 3 shows regions of the world by year of arrival.11 Mexico was by far the top sending country in the last decade, with more than four million immigrants from that country arriving between 2000 and 2010. Overall, 53 percent of immigrants came from Latin America (Mexico, Central America, South America, and the Caribbean). Table 4 reports the top immigrant-sending countries in 2010. In terms of sending the most immigrants, Mexico, India, China, the Philippines, El Salvador, and Guatemala sent the most during the decade. The former Soviet Union would also rank among the top sending countries as well if it were still intact. 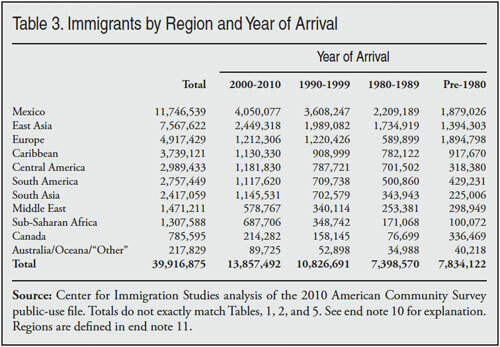 Table 4 also reports the share of immigrants from each country who arrived in the last decade. Thus the table reads as follows: 34.5 percent of Mexican immigrants in 2010 indicated in the survey that they arrived in 2000 or later. For immigrants from countries such as India, Guatemala, Honduras, and Brazil, roughly half arrived during the last decade. In contrast, for countries like Canada and Vietnam, few are recent arrivals. Table 5 shows the top sending countries in 2010 and those same countries in 2000 and 1990. 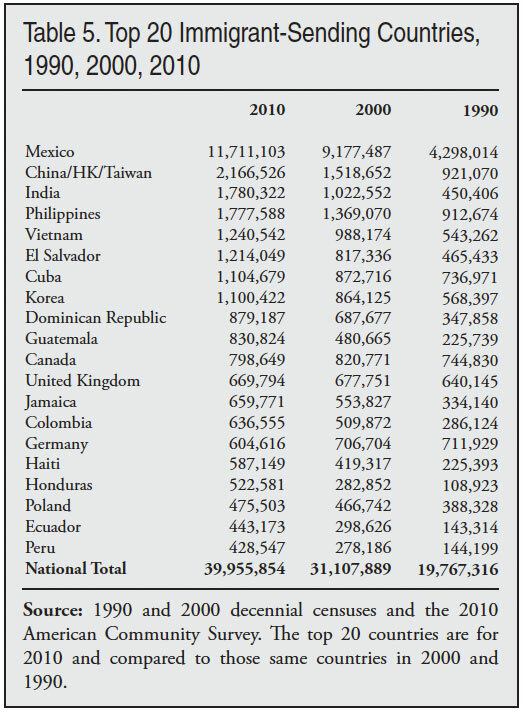 Table 5 shows that among the top sending countries, those with the largest percentage increase in their immigrant populations in the United States from 2000 to 2010 were Honduras (85 percent), India (74 percent), Guatemala (73 percent), Peru (54 percent), El Salvador (49 percent), Ecuador (48 percent), and China (43 percent). This compares to an overall growth rate of 28 percent during the decade just completed. 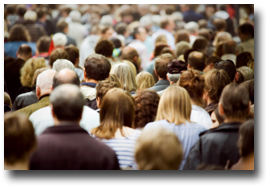 The ACS and CPS can be used to provide insight into the impact of immigration on the size of the U.S. population. 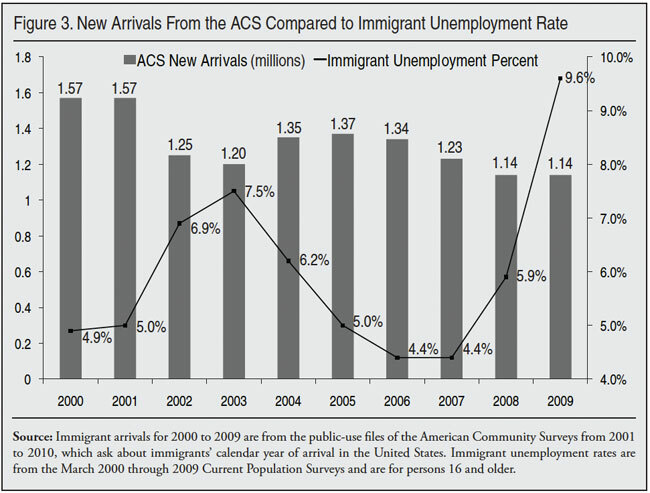 Table 6 reports six different methods using the 2010 ACS and CPS to estimate the effect of immigration on U.S. population growth since the last census. The first column in the table shows that between April 2000 (the control data for the Census) and July 2010 (the control data for the ACS) the U.S. population grew 27.9 million. The first three rows of Table 6 use the number of immigrants who arrived in the United States in the last decade to estimate the impact of immigration on U.S. population growth. As already indicated, in 2010 13.9 million immigrants indicated that they had entered the country in 2000 or later. Because those who arrived in the first three months of 2000 should already have been counted in the 2000 census we reduce this figure by 390,000, or three months worth of new immigration, to account for those who arrived in the first quarter of 2000.12 It is reasonable to view the 13.47 million immigrants who arrived over this time period as the basis for estimating immigration’s effect on population growth because this flow reflects current U.S. immigration policy — both legal immigration and the level of resources devoted to controlling illegal immigration. Of course, immigrants do not just add to the population by their presence in the United States. Based on the 2010 CPS, there were 8.98 million births to immigrants in the United States over the last decade.13 The first row of Table 6 adds the 13.47 million new arrivals to the 8.98 million births for a total of 22.45 million additions to the U.S. population from immigration. This equals 80.4 percent of U.S. population growth from April 2000 to July 2010. Not all births during the decade to immigrants were to those that arrived 2000 to 2010. Method 2 reports that, of the 8.98 million births during the decade, slightly less than 2.3 million were to immigrants who arrived during the decade. If we add this number to new arrivals we get 15.73 million additions to the U.S. population, or 56.3 percent of population growth. In Method 3 we just use new arrivals, which accounted for 48.2 percent of total population growth. Methods 4 through 6 use net immigration to estimate the impact of immigration on population growth. As discussed in the section on deaths and outmigration, our rough estimate is that net immigration during the decade was 11.27 million. This is the difference in the number arriving and the number leaving. If we add net immigration to total immigrant births during the decade it equals 20.24 million or 72.5 percent of population growth, as shown in Method 4. Method 5 adds just births to new arrivals during the decade to net immigration for a total addition of 13.5 million, which equals 48.4 percent of population growth. Net immigration by itself equals 40.4 percent of population growth, as shown in Method 6. It may be worth noting that growth in the immigrant population of roughly 8.8 million (see Figure 1) is not an accurate way of assessing the impact of immigration on population size because it includes deaths, which are not a function of immigration policy and are not connected with new arrivals.14 Table 6 makes clear that whether new immigration or net immigration is used to estimate the impact, immigration policy has very significant implications for U.S. population growth. The same data used in Table 6 not only provide an estimate of immigration’s impact on population growth, they have other uses as well. If we wished to allow the current level of immigration, but still wished to stabilize the U.S. population by reducing native fertility, we can roughly estimate what it would take based on the table. In 2010 there were about 36.2 million children living in the country who were born to natives during the decade. As shown above, immigration added 22.5 million to the U.S. population. To offset these additions it would have required 22.5 million fewer births to natives, or roughly a 62 percent reduction in native fertility. Since the native-born population already has slightly below replacement-level fertility, to advocate a nearly two-thirds reduction in their fertility to accommodate immigration seems grossly impractical. Educational Attainment. 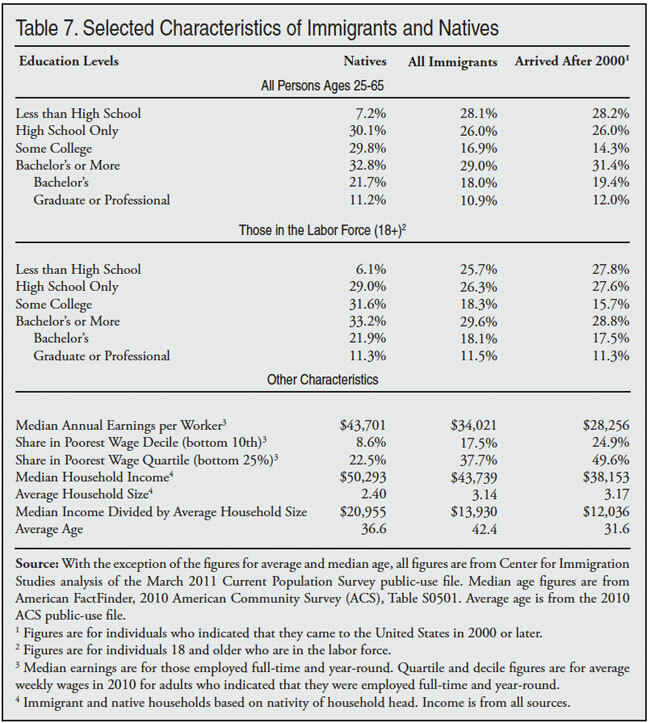 Table 7 reports the education levels of immigrants and natives. The top of the table reports figures for all persons ages 25 to 65. Based on the 2011 CPS, about 28 percent of immigrants 25 to 65 have not completed high school, compared to about 7 percent of natives. This difference in the educational attainment of immigrants and natives has enormous implications for the social and economic integration of immigrants into American society. There is no single better predictor of economic success in modern America than one’s education level. As we will see, the fact that so many adult immigrants have little education means their income, poverty rates, welfare use, and other measures of economic attainment lag well behind natives. The table also shows that a slightly larger share of natives have a bachelor’s degree than immigrants, and the share with a post-graduate degree is almost identical for the two groups. Historically, immigrants enjoyed a significant advantage in terms of having at least a college education. In 1970, for example, 18 percent of immigrants had at least a college degree compared to 12 percent of natives.15 This advantage at the top end has now entirely disappeared. The middle of the Table 7 reports the education only for adults in the labor force.16 The figures are not entirely the same because those who are in the labor force age 18 and older differ somewhat from the entire population ages 25 to 65 in their educational attainment. For example, the least educated natives in particular are much less likely to be working or looking for work. This means that they are less likely to be in the labor force. The right side of the table reports figures for those immigrants who arrived in 2000 or later. Overall, 16 percent of those in the labor force are immigrants and this is somewhat higher than their 12.9 percent share of the total U.S. population because, in comparison to natives, a slightly higher percentage of immigrants are of working age. The large number of immigrants with low levels of education means that immigration policy has dramatically increased the supply of workers with less than a high school degree, while increasing other educational categories more moderately. This is important because it is an indication of which American workers face the most job competition from foreign workers. While immigrants comprise 16 percent of the total adult workforce, they comprise more than 44 percent of adults in the labor force who have not completed high school. Figure 4 shows how recently arrived immigrants have increased the supply of different types of workers. It reports the number of immigrants who arrived in 2000 or later divided by the total number of workers in each educational category (immigrant and native). Thus, the figure shows that post-2000 immigrants have increased the supply of high school drop-out workers by 17.3 percent, compared to 3 to 5 percent in other educational categories. This means that any effect immigration may have on the wages or job opportunities of natives will disproportionately affect the least educated native-born workers. Income of Immigrants and Natives. In this paper we report figures for both earnings and income. Earnings are income from work, while income can be from any source such as working, investments, or rental property. Given the large proportion of immigrants with few years of schooling, it is not surprising that the income figures reported at the bottom of Table 7 show that, as a group, immigrants have lower median earnings than natives.17 (Earnings from the CPS are based on annual income from work in the calendar year prior to the survey.) The annual median earnings of immigrants who work full-time and year-round are only about 78 percent that of natives. And for the most recent immigrants, median earning are only 65 percent that of natives. Another way to think about immigrants and natives in the labor market is to examine the share of immigrants and natives who work for low wages. If we look at the 10 percent of full-time, year-round workers with the lowest weekly wages, we find that 17.5 percent of immigrants are in this bottom wage decile compared to 8.6 percent of natives. If we examine the weekly wages for the poorest fourth of the labor market, 37.7 percent of immigrants fall into the bottom quartile, compared to 22.5 percent of native-born full-time, year-round workers. Household Income. Another way to think about the relative position of immigrants compared to natives is to look at household income. The bottom of Table 7 reports that the median household income of immigrant-headed households is $43,739, which is 87 percent that of the household income of natives — $50,293. (Income, unlike earnings or wages, is from all sources, not just income from working.) In addition to having lower incomes, immigrant households are 31 percent larger on average than native households — 3.14 persons versus 2.4 persons. As a result, the per capita household median income of immigrants is only 66 percent that of natives — $13,930 versus $20,955. This is important not only as a measure of their relative socio-economic standing, but also because it has fiscal implications. Lower household income means that, in general, immigrant households are likely to pay somewhat less in taxes than native households. This is especially true for progressive taxes, such as state and federal income taxes, which take into account income and the number of dependents. Larger household size also means that, in general, immigrant households will use somewhat more in services than native households. Since households are the primary basis on which taxes are assessed and public benefits are distributed in the United States, the lower income and larger size of immigrant households has implications for public coffers. Age of Immigrants. The bottom of Table 7 shows that in 2010 the average age of an immigrant was 42.4 years compared to 36.6 years for the average native. The average overall age in the United States was 37.4. The fact that immigrants have a higher average age is a reminder that although immigrants may arrive relatively young, they age over time like everyone else. Partly for this reason, the belief that immigration will help fix the problem of an aging society is largely misplaced. Of course, those who argue that immigration will fundamentally change the age structure generally have in mind new arrivals. Table 7 shows that in 2010 the average age of immigrants who arrived in 2000 or later was somewhat younger than that of natives — 31.6 years compared to 36.6 years for natives. If we look at the most recent arrivals we also see they tend to be relatively young. In 2010 those immigrants who indicated they arrived in 2009 or the first half of 2010 had an average age of 29.8 years. This confirms the common belief that immigrants are younger than natives at arrival, but the difference with natives is modest. More important, the impact on the aging of our society is small. We can estimate the overall impact on the age structure of American society by simply calculating the average age in the United States with and without recent immigrants. Again, the average age in the United States in 2010 for the entire population (immigrant and native) was 37.35 years. If all 13.9 million immigrants who arrived in 2000 or later are removed from the data, the average age in the United States would be 37.62 years. Thus, including post-2000 immigrants does lower the average age, but only by .27 years. Immigration over the last 10 years, which has been numerically the highest in American history, had a very modest impact on the average age in the United States. If we remove from the 2010 ACS the 13.9 million newly arrived immigrants plus the more than two million children that these immigrants have given birth to in the United Sates in the last decade, the average age in the United States would be 37.87 years. So the full impact of recent immigration was to reduce the average age in the United States by about .52 years. Again, the impact is modest. Post-2000 immigration plus births to these new immigrants added 16 million new people to the U.S. population. But in a country of more than 300 million it is simply not enough to significantly lower the average age in the United States. In a 2007 report the Center for Immigration Studies generated population projections and examined the impact of different levels of immigration on the size and aging of American society. We found that although the current level of immigration will add 105 million to the U.S. population by 2060, it has only a small impact on the share of the population that will be of working age.20 There is a clear consensus among demographers, the people who study human populations, that immigration has a positive, but small, impact on the aging of society. A simple analysis of the ACS data confirms this conclusion. Labor Force Attachment. 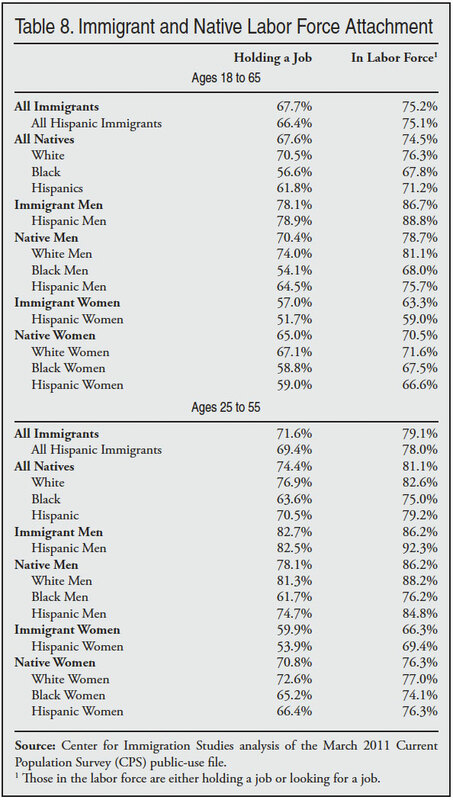 Table 8 shows the share of immigrant and native-born men and women holding a job or in the labor force based on the March 2011 CPS. Those in the labor force have a job or are looking for a job.21 The top of the table reports figures for persons 18 to 65 and the lower portion of the table provides the same figures for those in the primary working years of 25 to 55 — when rates of employment tend to be the highest. The table shows that immigrants and natives (18 to 65) overall have virtually identical rates of employment and labor force participation. However, male immigrants have higher rates of employment and labor force participation than native-born men, while female immigrants have lower rates than their native-born counterparts. For those in the prime years of 25 to 55, Table 8 shows that the overall rate for natives of employment and labor force participation are somewhat higher than for immigrants. But male immigrants 25 to 55 are still more likely to have a job than are native-born men, while labor force participation is the same for both groups. In contrast, native-born women in the primary employment years are much more likely to work than foreign-born women. As will become clear in this report, immigrants’ income, health insurance coverage, home ownership, and other measure of socio-economic status lag well behind that of natives. 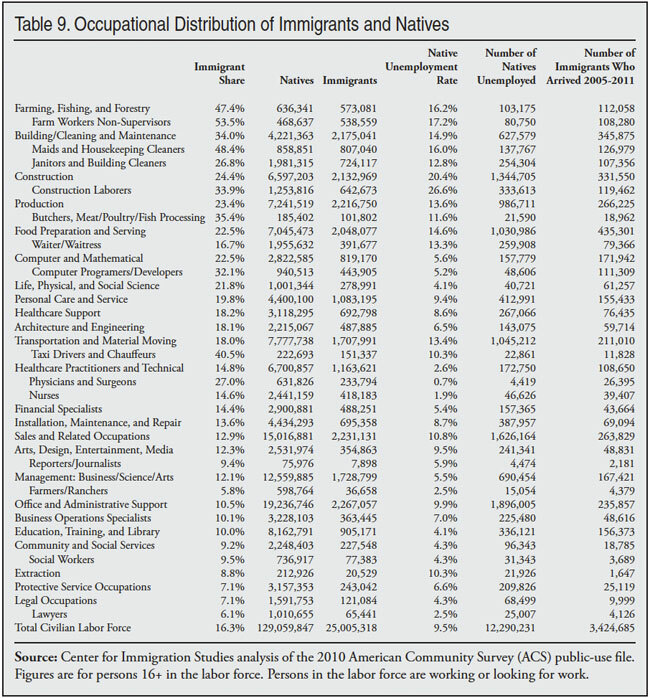 But Table 8 shows that these problems are not caused by immigrants’ being unwilling to work. Immigrant men in particular have a strong attachment to the labor market. Occupational Distribution. Table 9 shows the occupational concentration of immigrants and natives. The occupational categories are ranked based on immigrant share, which is shown in the first column. The numbers in the second and third columns show those employed and unemployed in each occupation. The table shows several important facts about U.S. immigration. First, there are millions of native-born Americans employed in occupations that have high concentrations of immigrants. While immigrants certainly are concentrated in particular occupations, it’s simply not correct to say that immigrants only do jobs natives don’t want. There are more than 20 million native-born Americans in the occupational categories of farming/fishing/forestry, building cleaning/maintenance, construction, production, and food service and preparation. More than four million of these natives are unemployed and they report one of these occupations as their last job. The second interesting finding in Table 9 is that in these top immigrant occupations unemployment for natives averaged almost 16 percent in 2010 compared to 9.5 percent nationally. It is hard to argue that there are no Americans willing to work in these high-immigrant professions. Perhaps the native-born workers are not where employers want, or there is some other reason businesses find these unemployed natives unacceptable, but on its face Table 9 indicates that there is quite a lot of un-utilized labor of this kind in the United States. It would be a mistake to think that every job taken by an immigrant is a job lost by a native. Many factors impact unemployment rates across occupations. But it would also be a mistake to assume that dramatically increasing the number of workers in these occupations as a result of immigration policy has no impact on the employment prospects of natives.